This was the best day trip we had so far. We started early for a big day in mountains of “Swiss Alps”. Schilthorn resides in Jungfrau region of Switzerland. It is 2970 meters above sea level. 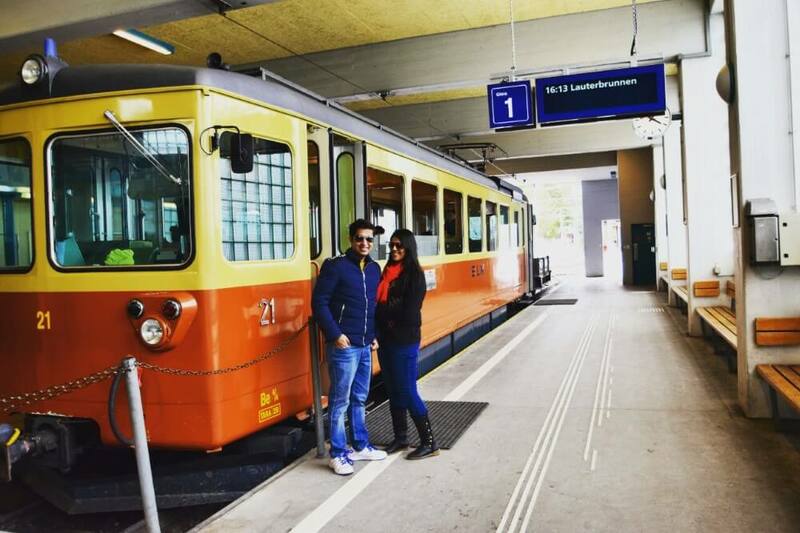 It was our, where we had the most amazing and adventurous trip possible from Interlaken. The air was very thin and cold at Schilthorn, where we took the jaw dropping alpine view. This is what we had always dreamt of! Travelling from Interlaken East Ost Station to the town of Lauterbrunnen. There are some beautiful views on the river while going up through the narrow entrance of the valley. We took our Europe’s longest cable car ride in the mountains. The whole experience was beyond words. There are 2 ways to reach Schilthorn from Interlaken. We suggest go up via Stechelberg route and go down via Grütschalp. That way you can cover more spectacular sceneries. The journey from Interlaken to Schilthorn takes about 90 minutes depending on the route. Board the train from Interlaken Ost Station to Lauterbrunnen (we recommend you to sit on the right of the train to have slightly better view of the way). 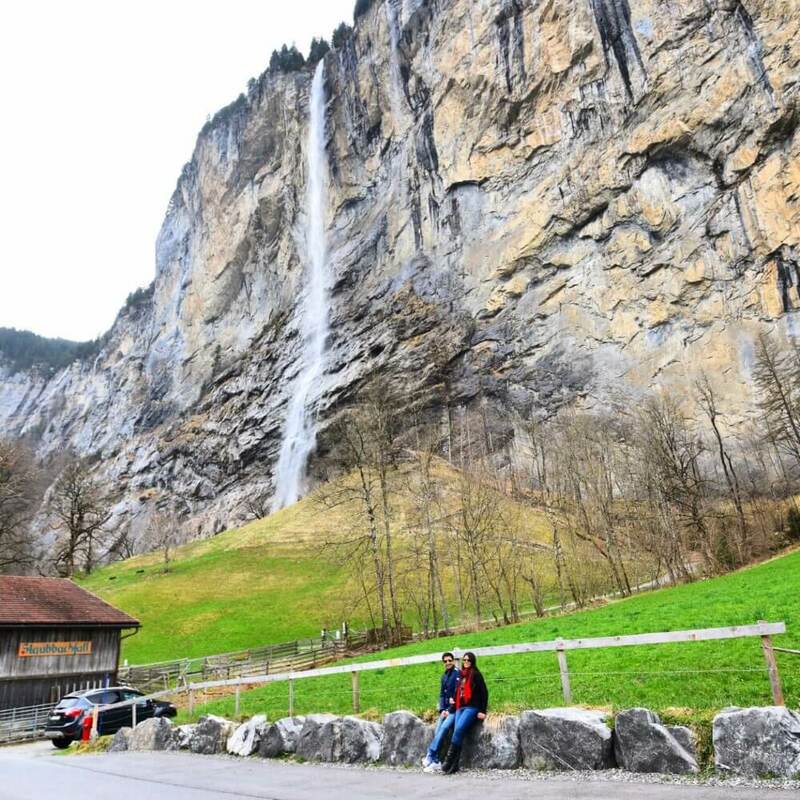 From Lauterbrunnen take bus to ‘Stechelberg Schilthornbahn’ (this 20 minute bus ride is full of most amazing views). Then board your first cable car from here and switch to another in Gimmelwald that will take you to Mürren. Board the train from Interlaken Ost Station to Lauterbrunnen. In Lauterbrunnen take the cable car to Grütschalp. From there get into the narrow gauge train to Mürren. This is the final leg of the trip. 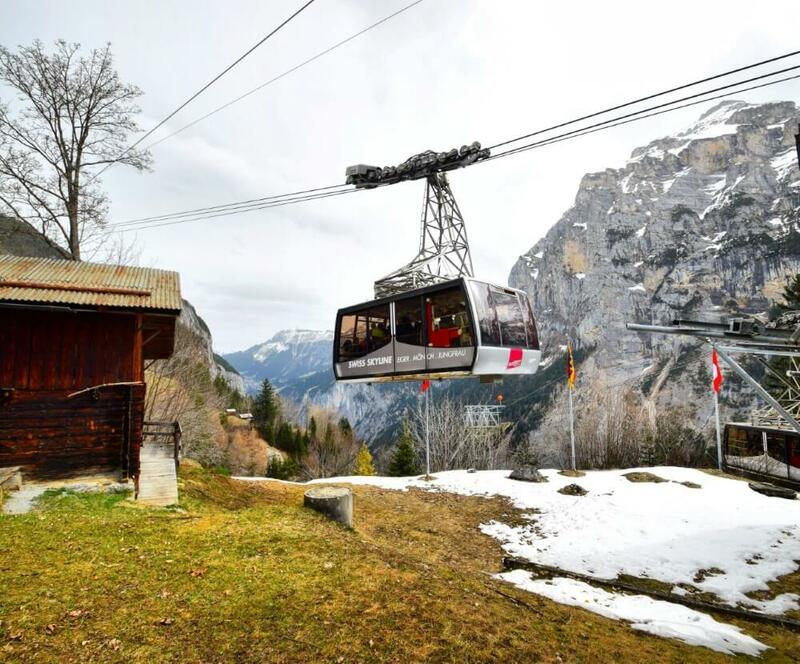 Board cable car from Mürren and switch to another in Birg. Cable car from Birg will take you to summit of the Schilthorn. NOTE: The journey getting up to the Schilthorn is half of the fun and you will witness one of the most amazing views. Weather plays the major factor in determining your schedule in the mountains. It is better to stay few days in Interlaken as your base, it increase the chance of getting the perfect shiny weather for your summit. Fortunately you have many options to check whether reports before planning your mountain’s expedition. There is a live feed coming straight from at Schilthorn where you can check for the best weather. Note:If it is a cloudy day, you can plan a side trip for the city Burn. When you are at the top of Schilthorn, you will embrace the best scenery of all time. 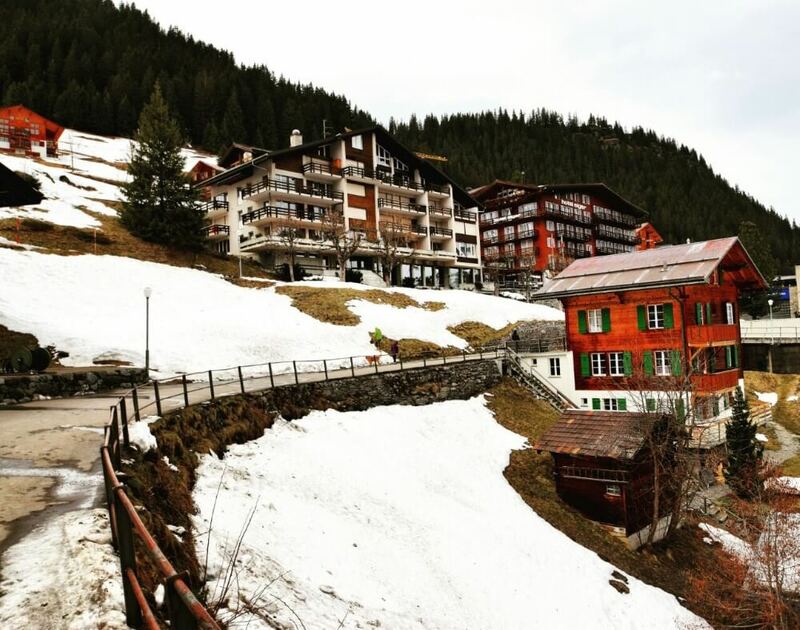 While standing in the heart of Swiss-Alps, you will witness the glorious jagged peaks of mountains covered in snow. 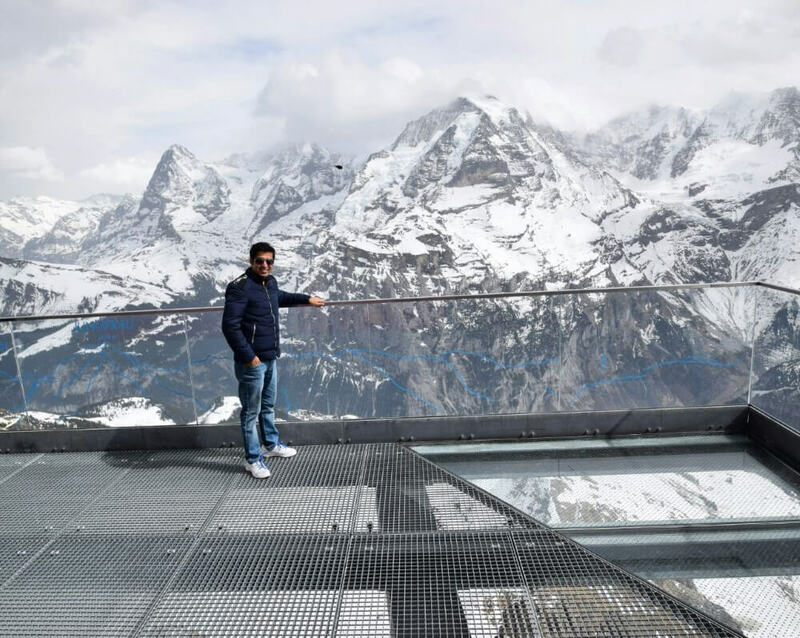 You will hat’s off to Swiss Engineers who made a 360- degree rotating restaurant with all superb facilities. From where you can enjoy your lunch while soaking in the amazing view of Alps. The restaurant is known as Piz Gloria. It completes one rotation in an hour providing the best panorama view. For more excellent view there is an open outdoor terrace from where you can look around the world famous mountain peaks. PS: We were lucky, because the bright sunny weather supported our excursion. We had all the clear views of dramatic peaks and valleys. For more clear and near view you can check-out mountains from binoculars, which are available at the terrace. Last but not least you can click pictures with James bond ;). Imagine watching James Bond in the frantic chase scene from the epic movie “On Her Majesty’s Secret service”. This daytrip to Schilthorn gave us more than what we were expecting. Thanks to the lovely weather which made it extravagant! Hope you will like our travel guide to Schilthorn, Switzerland in Jungfrau region. We loved our experience being there. 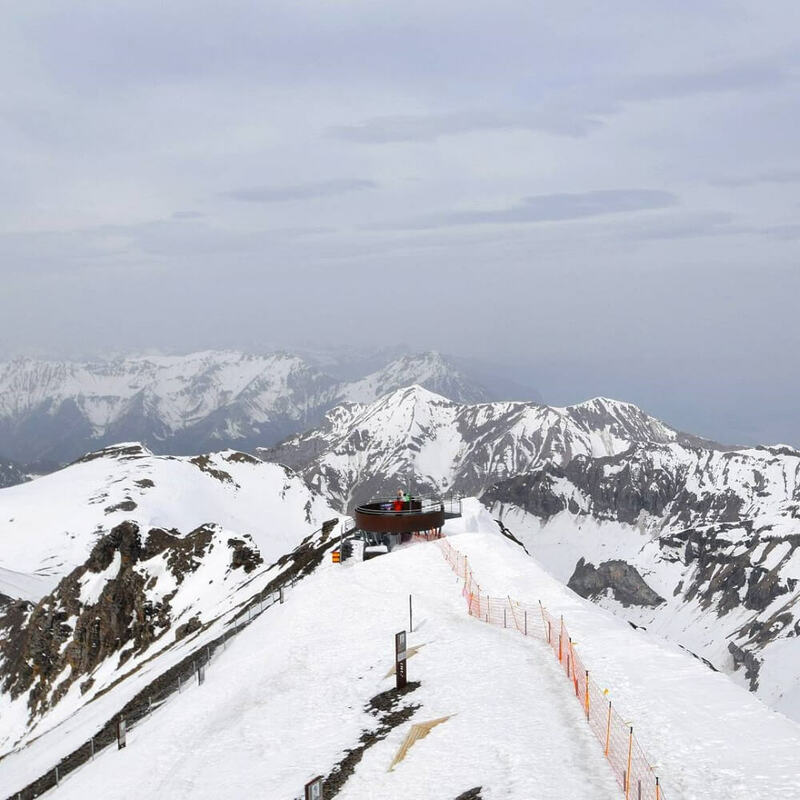 Plan your next trip to this magnificent place for the unforgettable view from Schilthorn, Switzerland. But keep weather in mind. Check our other post of Switzerland on our blog. to capture its so wonderfully. You seem to be enjoying your trip, hope you packed enough luggage. I have always wanted to visit the Swiss Alps but I never did due to the high costs of traveling in Switzerland. The views from the mountain top are amazing! And I would love to have lunch in the rotating restaurant and enjoy the full 360 degrees panorama over the mountains. I have just come back from Finland and I can’t tell you how much I love snow laden landscape. Switzerland is on my mind. I simply would love to spend my day at the revolving restaurant Piz Gloria. I can imagine how stunning that view would be. Thanks for the guide. Its helpful. I love all your photos of the Swiss Alps. 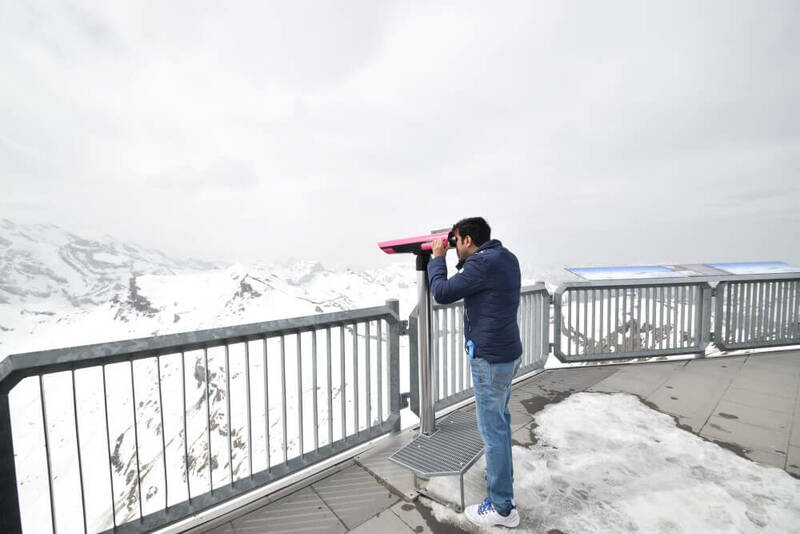 I originally planned to go to Jungfraujoch as well, but ended up going to Mt Titlis near Luzern instead. It was also very beautiful. The 360 restaurant there was also nice. What month do you think is the best to go there? I love the old looking trains that Europe has, they’re so wonderfully quaint. Such a gorgeous view you captured as well! And that waterfall literally made me sigh. You guys seem to be having a wonderful trip! 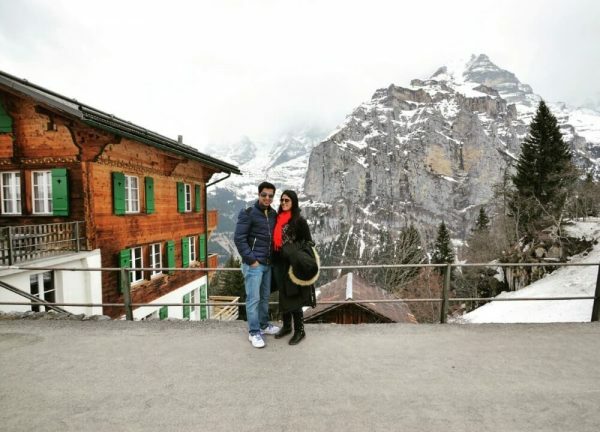 Switzerland is serene and your pictures are beautiful. I should say you were really lucky with the weather to could get those clear views. Actually hats off to the engineers for building a restaurant here. I will too like to explore Interlaken whenever will get a chance to explore Switzerland. It is so beautiful. Interlaken is in our plan when we go to switzerland, in almost a month. Schilthorn looks equally beautiful and I would love to visit here as well. Is it possible to do a trip to both interlaken and schilthorn from lucerne in a day and return back ? Switzerland is such a beautiful country. Glad you had such a wonderful time. Those mountains are just breath taking. I am pretty jealous that I have not been here yet. I want to spend a month travelling around various places in Switzerland and Schilthorn is definitely a must see! Thanks for sharing, we will definitely use your guide to plan our adventure. So right, this looks like a place taken from a James Bond movie! 😀 You were so lucky with the weather. Your pictures look amazing! It’s definitely a beautiful place to visit and could just imagine the view from that open outdoor terrace. First I want to stay that I stopped for a few minutes in your first pictures, what a view!! I have never seen snow ever! Hopefully next year but how much does it costs traveling here? And is it by bus or private car only? The view is just incredible and I can only imagine having lunch at the 360 degree rotating restaurant, taking in all that immense part of wilderness. I should plan a visit to Switzerland because i have never been there and i do love mountains. Thanks for a very complete article! The Swiss Alpes. We too had a great time, but we did Mt Titlis. We too had great weather as well. By the great photos, it looks like a great trip from start to the revolving restaurant at the top. A must do it we get a chance to head back to Switzerland. Thanks for the story. Amazing trip, Alps are gorgeous! I recently visited Zurich and Luzern. I didn’t go to mountains but Luzern has amazing views!!! Some great sights here! I think a hike around these areas will be very delightful even if it takes a bit of effort. Love that photograph with the waterfall in the background.